Steins;Gate was one of the greatest Anime I had ever watched. Because of this, when I was jumping into this new addition in the series I felt two different and conflicting ideas within me. The first was that few if any series could hold up to Steins;Gate and Steins; Gate 0 was merely a cash grab. The second of the two thoughts was that given how great the first show was this one had the possibility to be just as great, if not better. I am glad that I did not let my fears of a cash grab stop me from watching this anime. Steins; Gate 0 exceeded my expectations. The first anime features lovable Mad Scientist Rintaro Okabe, better known by his nickname: Okarin. Filled with a colorful cast, the first anime took time to establish said individuals and the setting before diving headfirst into the many butterfly effects caused by time travel. The idea of whether fate can be averted or not is key to the original anime. 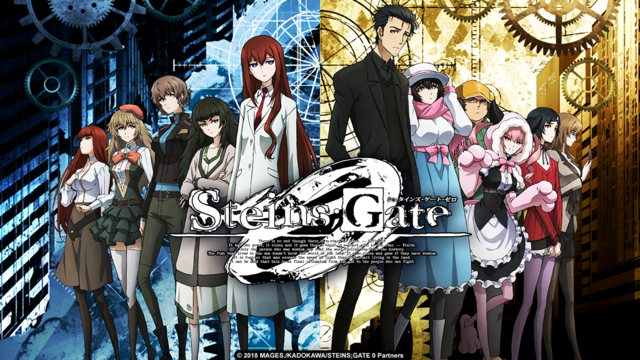 It is even given a name: Steins;Gate is the magical answer for Okabe to save all of his friends and lose none. Unfortunately, the trauma caused by constant loops is taxing. Okabe remembers every single attempt at saving those he cares about. By the start of Steins; Gate 0, one of those closest to him is left to die because no matter how hard he tries, it does not seem possible to save everyone. This missing friend sets the stage heavily for the newer show. While Steins;Gate started light hearted and gradually matured, Steins; Gate 0 sets its tone much quicker and runs with it. No more mad scientist antics for Okabe. He is now attending college and hoping to put the traumatic events of Steins;Gate behind him. But fate is not so easily dodged. Issues arise and some of them end up on a much grander scale than in the first series. Thanks to the fact that this series is a direct sequel to the original Steins;Gate, Steins; Gate 0 wastes no time getting to the story. While a few new characters are introduced, including the new fan favorite Maho Hiyajo, character development occurs as the story happens rather than before the story like in Steins;Gate. The writing is spot on. All concepts explained make logical sense. All of the shifts in tone feel natural instead of forced. The pacing is superb. Indeed, this is the one area that I took issue with the original Steins;Gate. That 0 was able to overcome the one issue I had with the original is just another example of how fantastic of an anime this is. The Opening Songs are both incredible and I never skipped either when viewing the episodes. Neither did I skip the ending songs. This is rare in an anime as I usually can find an issue with either an opening or ending for Anime in general. With a satisfying conclusion and plenty of suspense building up towards it, Steins;Gate 0 might have done the impossible. I dare say that it manages to compete with the original. Considering the critical acclaim of the first Steins;Gate anime, this is no small feat. An Anime that easily lives up to the original Steins;Gate 0 is an example of what happens when a sequel is of equal quality to the original production. The story does not feel like a simple retelling, and many of the old characters are explored in ways not done so before. Though many of the characters fall into obvious tropes, this does little to detract from the story in general. This is as must see as the original Steins;Gate.